A “stargate” type portal is found in North Dakota, opening to various worlds and… other places. There were a few places where I found the story to be a bit disjointed, as we jump between different characters and situations pretty frequently. It also it felt as though I’d stepped into a story already in progress, as there was very little of the backstory of just how the portal was found (more on that later). Nonetheless, I enjoyed this book quite a bit. After reading this novel, as I was entering it into Goodreads (a site which I recommend for anyone who’s “serious” about tracking and/or sharing the books they read), I realized that this was actually the second in a series of books. 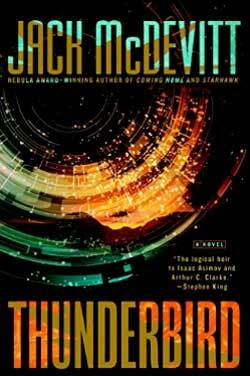 “Thunderbird” is a sequel to “Ancient Shores,” wherein I suppose I’ll get the backstory I was looking for. You should probably start there.